i just received my alternator now. i hoped not to be wrong when i will connect it. if anyone have some pictures of theirs connected at their bike,let us see them. Can you post a picture of your alternator - front/back/side? i am working on a "side support" that will mange the alternator not too "twist" on itself when he will be charging. the lower bolt is a 3/8 grade 5 bolt. on the rear connector of the alternator there is no letter at all,,so it would indicate which one is which ! after i will check for a V strap at the hardware store. Minimum hookup is the sense wire and the IG terminal. The indicator lamp is nice to have, I have mine located in the dash plastic just below the digital dash and off to the left. The indicator lamp came in handy when I was on a road trip to LA last fall. Light came on in Redding CA before I got too far down the road, replaced the alternator at the local Honda shop and back on the road in 24 hours. It gives an instant response to alt failure and you notice lights sooner than a gauge. 16 gauge wire is good for these connections. i am trying to found the "pigtail" that is sold for this alternator,,,,,,man it's rare!!!!!! they auto parts store told me to go at the scrap yard and found one on a bazou,,,with 3 feet of snow here thats funny. i have finished fixing the alternator in place,not the cables yet but i decided too redone the cooling system:the fan circuit. i decided too take it of and fixed another fan ,smaller . many are sugesting :power steering pump pulley from the old Honda Prelude years but i dont know much. after there was some mods to the pulley but it worked perfectly. do you have a machinist around you? thats the way to go. Can anyone help me, I made my own poor boy kit it's all installed and fits nice but my problem I hear of everyone getting good volt readings like 13.6 at a idle I have a hard time getting that at 3100 rpm it's like I have to ride in lower gears to bring up my rpm in order for my volt meter to show its charging. I'm getting 13.3 volts at 3500 rpm, 13.5 at 4000 rpm. I have my 8 gauge wire comming from the main power post of the alternator going to the battery with a 50 amp fuse 5 inches from the battery. Then off the IG post on the alternator I'm running 14 gauge and plugging it in were I unplugged the voltage regulator. The only wire that gets juice with the ignition turned on I think it's a black wire with a red stripe if I recall. My alternator is a new Chevy mini street rod race 70 amp 3 wire. I don't understand this I'm hooked up the same way everyone else is but I have to have 3100 rpm in order to charge. Any help would be greatly appreciated the warm weather is here. If this is not what you have, need a picture of the alt where the posts are. Good luck. what are the diameter of your pulleys? where did you connect the SENSE wire of the alternator,? 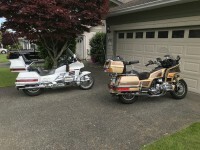 check on goldwingdocs.com for photos ,,many persons have modify their GW ,,i sent some pictures myself. Thanks for posting the pics. Checked the owner of the thread, be better if you started a new one so we can be specific about your issue. Will review your issue regarding the wiring. "I have a 2 inch pulley and 2 1/2 on the alternator that 2 inch pulley should be turning that alternator much faster than a 3 or 4 inch pulley"
the motorcycle engine dont revs as automobile engine and just check on your car the alternator and your crank car pulley. So do you think my problem is my crank pulley is to small? Where did you connect your sence wire? your alternator cannot reach his max output because it is too slow. when you fit the 4 inch crank pulley you will have to take the radiator,the lower part,further by 3/4 inch because the fan will touch the alternator strap.check my picture. i have found some picture of my open harness too .